You must make reservations at least 5 minutes in advance of the time at Marty's On Newport. Marty’s on Newport is an intimate entertainment venue, bar, and diner. We look forward to bringing you shows that even we thought were impossible to see in a venue like this. Marty’s on Newport, a new California Classic. I called a couple days before up until the day of the concert as I had a couple questions and no answer. I went on their website days before and the day of the concert, and not once did it mentioned this establishment being closed! Closed as in, NO CONCERTS ALLOWED!! This happened on 2/22/19. Very disappointed. Even Open Table allowed table reservations. They shouldn't! The concert that we were supposed to go to was cancelled and moved to La Santa in Santa Ana. Good vibe. Good music. But dirty. Reserved a booth and got there and no booths left. Was looking forward to a good meal as well, but menu was very limited. No steaks listed like their pictures show. The staff is super friendly and fast. Love the burgers (would enjoy a chicken burger alternative also). Books a variety of shows and keeps the pricing reasonable. Great service and good food- a fun evening with friends. We were pleased, but stage could be raised. To hard to see the band. Awesome Band! Great people! Nice, attentive & skilled bartenders. Fun Night! Had a fantastic time. I was worried based on online reviews but it couldn’t have gone any better. Not sure who my waitress was but she was perfect. Last night i went to Marty's for the first time and was a little skeptical after reading some of the bad reviews. I thought where the heck will I park so I don't get towed. When we arrived there was plenty of Parking. We got a spot right in front of the door! I had made a reservation for a table ofor early access at 7:30 and at 7:30 they let us in. Since we were a party of 2 our seat was at the bar. I asked the very friendly and helpful bar tender Monica where would be the best seat to watch The concert. She couldn't of been more helpful. Also the other female who was bartending was just as friendly and helpful. We had about 5 drinks that were made very well with the perfect amount of alcohol and 2 single burgers hat were delicious. The bartenders including 1 gentlemen were were busting their butts all night and were fast, efficient and friendly. Thank you for a great night and experience. Don't always trust the bad reviews people! Show up early and treat your bartenders with respect and be nice. It's not that hard. Also guy at the door told everybody if your not parked in the parking lot you'll get towed and the menus also state it. So I guess if u got towed u were warned. We reserved a table but upon arrival was told we had to sit at the bar since we were only 2 and tables for party of 4 or more. This should be on the website. 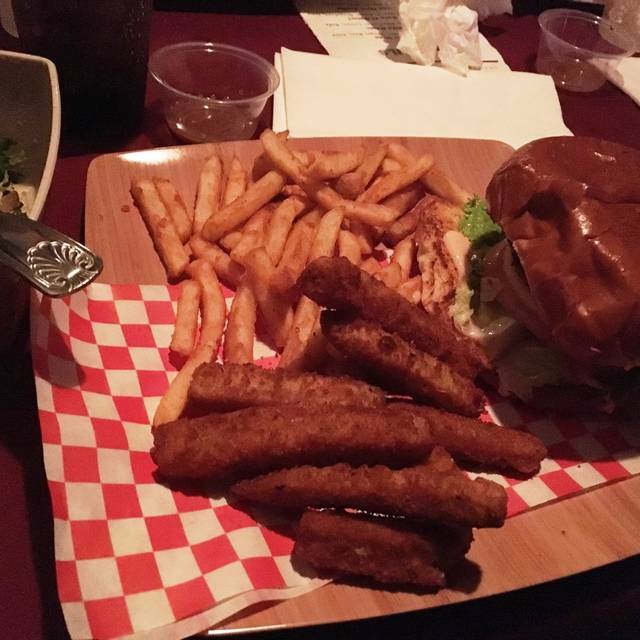 The website also showed good food but only fries, burgers or chicken strips were the chices. The best thing was the music! Strange Days is an awesome band! Music was good, food was fair, nothing special. Was disappointed when they kicked us out after the show was over at 10:30 pm. No advanced notice that there was another show after the one we attended. Don't think I will return to this venue. I am giving this a five star review because it is an excellent place to see a band. The staff were super great from the time you came up to the door, the wait staff excellent and not a single snobby employee, which in my experience is unusual! The only two things I would change .. 1. Only one toilet in the ladies room ( which wasn’t actually a problem but it could be) 2. A little better air circulation. I felt like I might pass out at one point but I didn’t want to leave the front. Had dinner reservations for 7:30. Arrived at 7:00 to have a couple of drinks before eating. We were told “sorry you cant come in til 7:30”. Had to walk across the street for a beer in the cold December evening. Came back right on 7:30. We were told that because if the “cover and sound check” that we still couldn’t enter. WTF!! Kept waiting outside in the cold for another 20 minutes or so until we were allowed in. Don’t take F’ing reservations for a set time and then keep punters waiting outside! That’s just ignorant with a whole heap of bull customer service thrown in! Once inside our server was very helpful and nice but I guess he realized he had a lot to make up for! We never made it in to our dinner reservation. We spent 45 minutes looking for parking!!! I wouldn't recommend this venue to anyone. It was way too loud unless you have musical earplugs. I didn't have to suffer the next day consequences due to the volume of the music for the venue size. My husband couldn't hear anything. I read capacity was 150 people. There were two times that many people if not more. What a hazard. Never again. Band stopped playing 35 minutes into session. Malfunction? Who knows? 9:40 pm , no reason to stay. Between Uber, reservation obligation, tickets -date night was a bust. Excellent dive bar for Live music. I only gave a negative review because I reserved a table for dinner but when you get there, there is no such thing. If you like dive bars with outstanding service, great drinks, good bar food, and excellent local music; you’ll love it. Saw The White Buffalo and had an unobstructed view at the bar the entire night since we arranged to eat early. Gray place but food is terrible. Bar staff was friendly and fast. Burger for dinner was great! Only bad thing is that you can not see the stage unless you are in front. Marty’s has a captive audience and I was very grateful to have to booth we could hang out at for the whole concert. All tables basically seat at the same time. There is 1 waitress for about 12 tables and she described the back as only 1 cook. From time sitting down to food served was over an hour, after 8:30. When u get there she tells you that u have to prefer at least $15 of food. Burgers are $10, fries are $5, chicken strips are $8. The burger was ok and there were plenty of fries. To make our $15 minimum per person we ordered “loaded fries” which are supposed to be like In n out Animal fries. There was a small dollop of sauce/onions in the middle of a basket of fries. Unimpressed. If u want to have a place to sit at a concert at Marty’s, this is your option. Food was decent and the waitress hustled but overall the experience was very average. Have the right expectation that u are basically paying $15 a person to sit and they throw in some very basic bar food...you will be pleasantly surprised. I used OpenTable to reserve seating for dinner/ early entry before a 9pm show. I made the reservation for 730p. When we arrived, the bouncer let us know that the band was still doing their sound check and had to wait. At 745p, he let us in and scanned our tickets. There was no one to greet us, so we took seats at the bar. The bartender handed us the drink menu to look over. When we inquired about the food/ dinner menu, she said that the kitchen is closed for the night. So there we were with empty stomachs and $11 beers over an hour before the first opener is supposed to perform. The bar/venue does not allow re-entry, so we couldn't leave to get something to eat without forfeiting the show we paid to see. First of all our server Tim was amazing. The door guy was helpful when we arrived. Had a great night dancing. Wish there were a bigger ladies room. The smoking patio could use some better lighting and ventilation. That place shouldn’t be open. It’s not up to safety codes. We came for a band/concert and reserved a booth at 7:30. We were seated late, but that wasn't the restaurant's fault; it was because the band was not finished with their sound check until 45 min later. Anyway, the food was pretty good. I ordered a veg option: pulled mushrooms (a take on pulled pork). Tasty, but I wish there were more mushrooms, sauce, and coleslaw. Fries were excellent. We were mainly there for the band, but I would go back. For bar food, it was above average. Service was great. We never made it in. We arrive for our dinner reservation and were told by the doorman that any cars in the parking lot behind the restaurant would be towed. Can I spend 20 to 30 minutes looking for a spot to park. All of the lots were marked private with the threat to tow. As a consequence we did not go inside and walked away from our 50+ dollar tickets for the entertainment. We went over to a Korean barbecue restaurant and had a wonderful time. I would suggest that you warn potential customers regarding the parking issue so they can arrive early or Uber or make other parking arrangements. I'm so happy and impressed every time I go here. The new menu is better than ever! Showed up at 7:29 for my 7:30 reservation and was told there were no available tables/seats. Hostess told me I should have come earlier. Website says doors open at 7:30. We reserved a table, but never got one, stood for hours and the music was supposed to start at 8, we left at 9:40 and the band still hadn't started. Total waste of time and money. Truly a dive bar in a neighborhood I used to live in. As for the bar there is no draft system since opening, which I believe was 5 months ago. 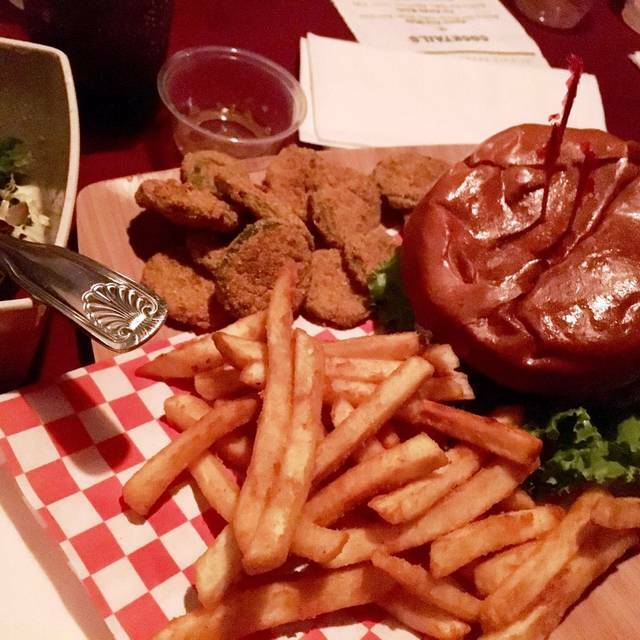 Food was bar food but overpriced, not knowing if this was concert related or not but A burger for 19 bucks is a little much. I really went only for a concert waited all night to see whom i came to see as the Headliner and they played for only 40 minutes. Awesome dive bar with a stage ! Strong drinks and good food ! Definitely will be going to another concert . Marty’s is a great venue for concerts. While it is a bit of a hole in the wall, we got to meet our favorite artists and watch a great show! The food was decent and the drinks were strong. The prices were to be expected for a “concert” event. The bartenders were extremely quick but the food took a while to come out. Overall I give Marty’s a 4/5. I will be back, hopefully often!!! I have been going to Marty's off and on for over 15 yrs. I have always enjoyed my time there. The two things I didn't care for was the price for a beer. And how the booths didn't accommodate the big people. I would have preferred the tables better. Booths take up too much space. Made reservations to have a seat and get early entry to a show. Seats were great. Food was too. Great place to see a band. Parking is miserable and the food is fairly expensive, other than that the place is pretty awesome. For the event, it was fun & the bartenders where great & the workers friendly.It was not to crowded & not like the reviews that I read in the passed. No crowded restrooms & the airconditioning work fine.It was not hot in the bar.Great fun & fans had a chance to see the group up close. GREAT TIME ! !